There are three phases: pre-election, election, and post-election . . . Where the first two phases are well handled, the post- election environment is peaceful but where they are poorly managed, the post-election environment is usually crisis-ridden. Given that not much work exists on post-election questions and their management in Africa, the Society for Peace Studies and Practice would like to commit it 2015 to addressing this critical issue, shedding more light on the nature, impact and management of post-election environment in Africa. Our particular interest is how to build peace after elections. . .
How do we restore healthy relationship between political actors after elections? What should be the role of winners and losers of elections? What should be the role of the judiciary, political parties, the media, electoral management bodies, private but prominent citizens in preventing post-election violence and other forms of political instability? What are the existing global best practices in post-election peace building? There will be special panels on post-election peacebuiling in Nigeria covering the 1999, 2001, 2003, 2007, 2011 and 2015 elections. . . The conference program will consist of Commissioned Papers (Plenary Session) and Open Theme/Special Panels (Parallel Sessions). Potential participants are therefore invited to submit abstract proposals to the organizers. In the event of the abstract being accepted, the deadline for submission of full draft paper will be 30th May 2015. 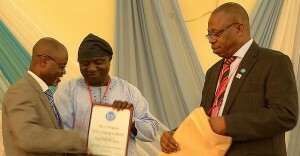 Details are available at http://www.spsp.org.ng . The Society for Peace Studies and Practice (SPSP) is a Not-for-Profit organisation that promotes non-violent approach to conflict resolution, through multi-level research, advocacy and actions that strengthen local capacities that will bring about a sustainable culture of peace. The Society began as the brainstorm of a group of passionate advocates of the postgraduate programme of the Peace and Conflict Studies, Institute of African Studies, University of Ibadan, in 2003 seeking to prioritize conflict management as a professional practice and how to streamline the ethics that will guide scholars and practitioners in the field of peace building. Initially spearheaded by staff and student members from the University of Ibadan led by Professor Isaac Olawale Albert; the Society was formally initiated and registered with the Corporate Affairs Commission (CAC/IT/NO.21194) as a Not-For-Profit Civil Society in 2004 and has gained national outlook and acceptance with its network of branches spread all-over Nigeria and beyond.